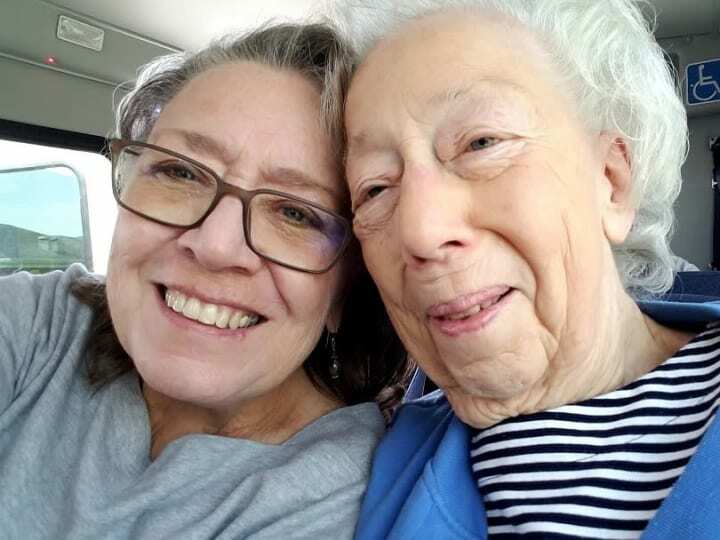 As the Dietary Manager at Churchill Terrace in Fulton, Missouri, Reed wants residents there to have good home cooked food and a restaurant like dining experience. 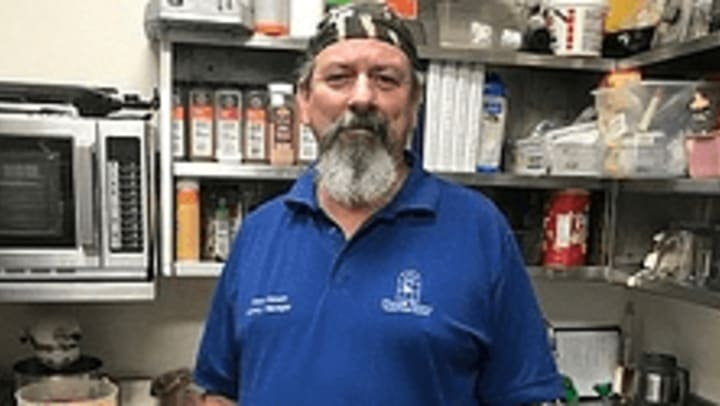 He oversees breakfast and lunch Mondays through Fridays and says that what he enjoys most about his job is getting to know residents who all have different life stories. Reed mentioned that a downside to working in an assisted living community is when residents “move on,” but he jokingly refers to occasional “ghosts in the kitchen,” who keep him company. Recently Reed was given special recognition by Veterans United Home Loans. 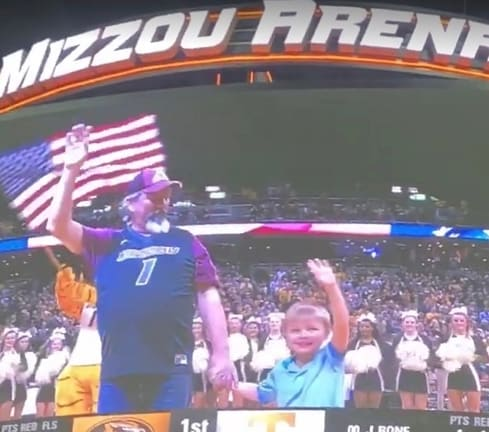 Representative Jena Blythe invited Reed to be Hero of the Game at the January 17 MU Tigers basketball game. He and his grandson were delighted to accept the honor. 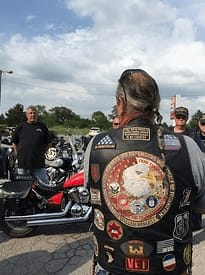 Reed serves the mid-Missouri area as Senior Ride Captain of the Patriot Guard Riders, whose mission, according to their website, is to “ensure dignity and respect at memorial services honoring Fallen Military Heroes, First Responders and honorably discharged Veterans.” He and many others honor our fallen vets and first responders by escorting them from airports to their home towns and by a group presence at funerals. In addition to volunteering with the Mid-Missouri Patriot Guard Riders, Reed is also involved in The Central Missouri Honor Flights whose mission is to “transport America’s veterans to Washington, D.C. to visit the memorials dedicated to honor their service and sacrifices.” Reed’s wife manages the Facebook page which has over 5,000 followers: Mid-Mo/NeMo PGR AO. Extending beyond his organizational involvement, Reed and his associates are often involved in taking care of veterans when the bureaucracy of government assistance just isn’t efficient. For example, they helped build a wheel chair ramp for one veteran and assisted in getting another vet’s water heater fixed. Then there was the establishment of Sterling Wyatt Park off Old 63 in Columbia. After flags kept getting stolen, Reed and others raised funds to put up a 25 foot flag pole and permanent memorial. “If we see a need, we try and take care of it,” he said. And certainly, the need is there. 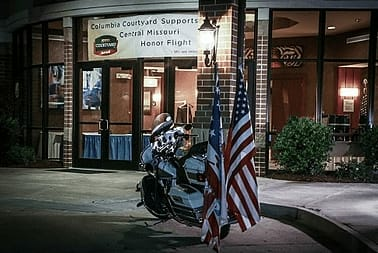 Reed pointed out that The Central Missouri Honor Flight Riders and the Mid-Missouri Patriot Guard Riders always welcome new volunteers, veterans or not, so pass the word! A huge thank you to Reed, a valued Americare employee, an honored veteran, and extraordinary patriot who continues to serve his community and his country. May the years ahead be filled with great meals for Churchill Terrace residents from the guy with a big heart, terrific jokes, and genuine concern for the welfare of others.